Good news! Here’s a nutrient that starts fighting fat the moment you put it in your mouth and actually helps you lose weight the more you eat of it! What is this whittle-your-middle nutrient? Fabulous fiber! And before you start thinking of gritty, twig-like cereal that doesn’t taste any better than the box it came in, let me tell you that fiber doesn’t have to taste like cardboard, sticks, or sand … or even raw beets (yuck). Here are those five high-fiber, fat-fighting foods … and some delicious ways to eat them! Take that fat! The versatile bean is just loaded with slimming fiber. One cup of your average-joe bean has more fiber than the most Americans eat in one whole day. Beans can play either a star or supporting role in many delicious dishes. 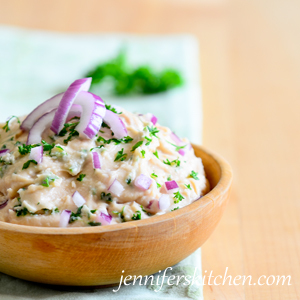 With lots of flavor and very little fat, this white bean dip is a hit even for those who don’t normally like beans. With fresh tomatoes, corn, black beans, avocado, and lime, this salad makes a beautiful and delicious summertime dish. Kale provides more nutrition per calorie than just about any food. Add high-fiber white beans to this soup and you have a hearty and nutrient-packed main dish soup. In the mood for something sweet and chewy? While a snickers bar may fill that description, it will also fill out your waistline. 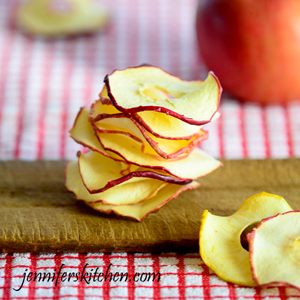 Try some sweet, chewy dried apples instead. They offer you vitamin C, iron, and a whopping 7 grams of fiber (for one cup) – with no sugar and no fat! Easy to make and a good source of protein, iron, and fiber, quinoa (pronounced KEEN-wah) is quickly charming its way into kitchens across the country. One cup of cooked quinoa gives you 5 grams of fiber. 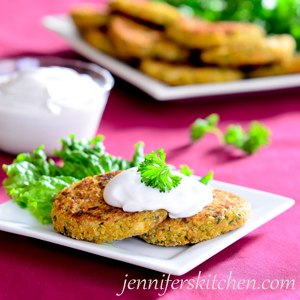 Packed with super-nutritious quinoa, these patties are easy to make and wonderfully delicious! 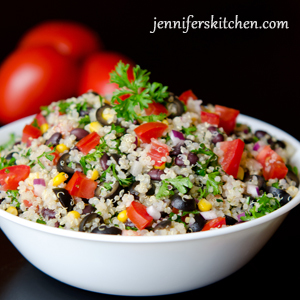 Made from fresh vegetables and whole grain quinoa, this dish is highly-nutritious and makes a delicious picnic dish. Even if you hate healthy food, you probably love strawberries, which is great because they’re so good for you. Not only are they loaded with slimming fiber, but they’re also a super source of vitamin C and manganese. One cup of strawberries contains a luscious 5 grams of fiber. A berry nutritious breakfast cereal. Drink up the sweet flavor of summer with this luscious strawberry milk. So good for you, you can eat it for breakfast. You can make this Berry, Berry Sauce all year round – even when strawberries aren’t in season – by using frozen strawberries. This delicious, super versatile grain is much higher in nutrients – including fiber – than white rice. 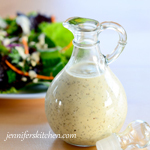 It can be used in a plethora of dishes, from main dishes and salads to breakfast and dessert. One cup brown rice offers 4 grams of fiber. How to cook perfectly fluffy brown rice every time. With brown rice, black beans, fresh tomatoes, and corn, this easy-to-make salad is loaded with fat-burning fiber. For a change, try creamy brown rice cooked overnight in your crock-pot. Thank you for your comment, Glenn. 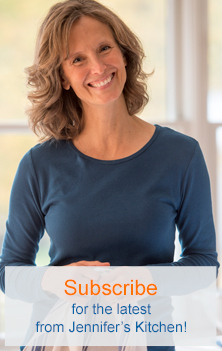 I hope you get a chance to try one of the recipes.